Braided leader with varying sink speeds. Loops at both ends. Color denotes density and sink speed. 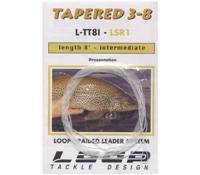 A superb range of gently tapered Braided Leaders, providing excellent turnover and delicate presentation. Finished with a neat loop at both ends. B.S. 18-20 lbs.